As the theatrical release for Incredibles 2 nears we couldn't help but spread the word regarding all of the "Incredible" activity, coloring and reading books (including the must-have, The Art of Incredibles 2) which have been popping up on Amazon. The books will be released beginning May 1 through late August 2018. Below are the titles sorted by release date - click any title for more information or to pre-order. UPDATED - Check out our latest video reviews highlighting 14 different Incredibles 2 books as well as The Art of Incredibles 2. Incredibles 2: The Junior Novelization - 144 pages. Incredibles 2: Sweet Dreams, Jack-Jack - 40 pages. Relive the action of Incredibles 2 in this hardcover picture book featuring fun and stylized artwork! In Incredibles 2, Helen (voice of Holly Hunter) is in the spotlight, while Bob (voice of Craig T. Nelson) navigates the day-to-day heroics of "normal" life at home when a new villain hatches a brilliant and dangerous plot that only the Incredibles can overcome together. Incredibles 2: A Real Stretch: An Elastigirl Prequel Story - 240 pages. Set before the events of The Incredibles, this original prequel story is focused on Elastigirl's crime-stopping adventures during the golden age of Supers. Incredibles 2 Little Golden Book - 24 pages. Incredibles 2 Read-Along Storybook and CD - 32 pages. Relive the action of Incredibles 2 with our best-selling Read-Along Storybook and CD, featuring narration, character voices and sound effects from the hit film! Incredibles 2 Ultimate Sticker Book - 16 pages. Starring children's favorite superhero family and packed with more than 100 stickers and fun facts, join the amazing Mr. 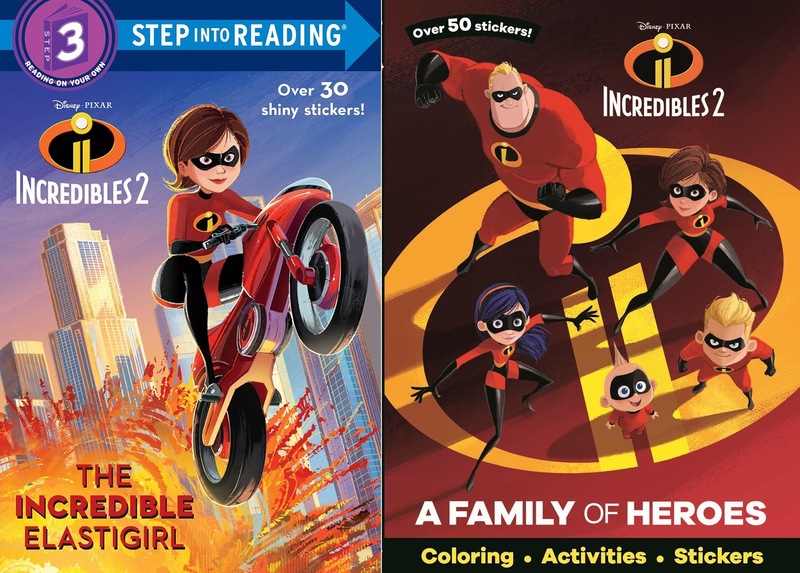 Incredible, Elastigirl, Violet, Dash, and baby Jack-Jack on their latest adventures with Ultimate Sticker Book: Disney/Pixar Incredibles 2. The Incredi-Files - 96 pages. The Incredible Elastigirl (Step Into Reading) - 32 pages. Incredibles 2: The Official Guide - 96 pages. Incredibles 2 Movie Storybook - 96 pages. Incredibles 2: Heroes and Supervillains - 44 pages. Join your favorite superhero family for some coloring and sticker fun in Disney Pixar Incredibles 2 Heroes and Supervillains! Incredibles 1 and 2 Battle of the Supers - 96 pages. Grab your favorite colored pencils and add color to every page with Disney Pixar The Incredibles and Incredibles 2 Super Adventures. Incredibles 2 On a Mission - 128 pages. Disney Pixar Incredibles 2 On A Mission includes 12 amazing watercolor paints to complete fantastic pictures of Mr. Incredible, Elastigirl and lots more from Disney Pixar Incredibles 2! Incredibles 2: Time to be Super! - 32 pages. Relive this super sequel with all of your favorite Incredibles characters and project 20 fun images from the movie on the wall while you read! Incredibles 2: Dash's Super-Secret Super Notebook (Replica Journal) - 112 pages. Experience Incredibles 2 from the perspective of speed-demon Dash in this hilarious movie retelling. Become a part of this super adventure with interactive lift-the-flaps, gatefolds, and Dash’s doodles throughout! The Art of Incredibles 2 - 168 pages. From Pixar's upcoming film Incredibles 2, this making-of book is a dive back into the beloved world of the Incredibles. The Art of Incredibles 2 explores Pixar's highly anticipated sequel through colorful artwork, energetic character sketches, intriguing storyboards, and spellbinding colorscripts. Incredibles 2 Cinestory Comic - 384 pages. Don't miss Incredibles 2 in theaters June 15, 2018! Numerous Incredibles 2 books have started to pop up on Amazon.